Recognizes a protein of 145kDa, identified as CD11c. 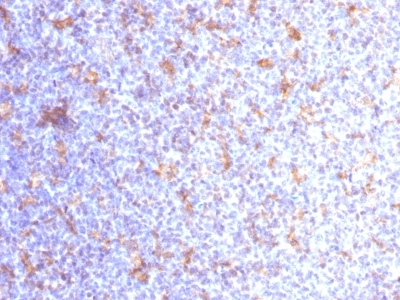 CD11c (ITGAX), a member of the leukointegrin family, shares the same beta subunit with other members of the leukocyte adhesion molecule family, which includes CD11a (LFA-1), CD11b (MAC-1) and CD11d (ITGAD), but has a unique alpha chain. 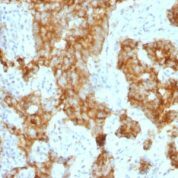 CD11c has been shown to play a role in phagocytosis, cell migration, and cytokine production by monocytes/macrophages as well as induction of T-cell proliferation by Langerhans cells. 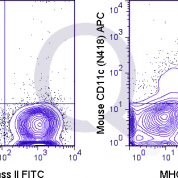 CD11c is expressed prominently on the plasma membranes of monocytes, tissue macrophages, NK cells, and most dendritic cells (DCs). A lower level of expression is also observed on neutrophils as a result of its high level of expression on most DCs. 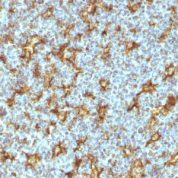 An antibody to CD11c may aid in identification of lesions with histiocytic origin. It may also been used as a marker for hairy cell leukemia in paraffin-embedded tissues. 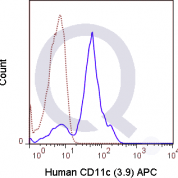 Anti-Human CD11c Positive Control Sample: Human dendritic cells. Human lymph nodes and tonsils. enQuire Bio's CD11c Anti-Human Monoclonal is available for Research Use Only. This antibody is guaranteed to work for a period of two years when properly stored.